A landmark work of art history: lavishly illustrated and extraordinary for its thoroughness, A History of African-American Artists -- conceived, researched, and written by the great American artist Romare Bearden with journalist Harry Henderson, who completed the work after Bearden's death in 1988 -- gives a conspectus of African-American art from the late eighteenth century to the present. It examines the lives and careers of more than fifty signal African-American artists, and the relation of their work to prevailing artistic, social, and political trends both in America and throughout the world. 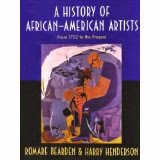 Beginning with a radical reevaluation of the enigma of Joshua Johnston, a late eighteenth-century portrait painter widely assumed by historians to be one of the earliest known African-American artists, Bearden and Henderson go on to examine the careers of Robert S. Duncanson, Edward M. Bannister, Henry Ossawa Tanner, Aaron Douglas, Edmonia Lewis, Jacob Lawrence, Hale A. Woodruff, Augusta Savage, Charles H. Alston, Ellis Wilson, Archibald J. Motley, Jr., Horace Pippin, Alma W. Thomas, and many others. Illustrated with more than 420 black-and-white illustrations and 61 color reproductions -- including rediscovered classics, works no longer extant, and art never before seen in this country -- A History of African-American Artists is a stunning achievement.